In this article, you’ll discover 10 of the best WordPress competitor platforms that are definitely worth your try. WordPress powers a whopping 60% of all websites, which also means that the remaining 40% of the Content Management System (CMS) market shares goes to the popular alternatives to WordPress. So, if you’re looking for some fresh CMS or simply alternative blogging platforms, you should definitely try any of the following. Final Verdict: What Can You Use Instead Of WordPress? 1. Is WordPress Similar To Wix? 2. Is Ghost Better Than WordPress? 3. Can I use WordPress with Wix? Medium is a fierce competitor of WordPress. It allows anyone to create a free account and start sharing articles, personal stories, or your travel photo collection. Medium’s content management system has one of the cleanest User Interface (UI) to use. It’s super easy to understand and master. Medium’s publishing platform has been gaining popularity because it is free, helps you monetize your content and get in front of an audience which you’d have to build from scratch using WordPress. Medium allows you to embed tweets, Instagram photos, YouTube and Vimeo videos directly by placing the link. You can create images in any third party tool like Photoshop and directly insert links on those images. It can be a free eBook or a follow request. With Medium’s tags feature, you can improve your search visibility and target audience that is already interested in reading your content. It’s a minimal platform where you don’t have to deal with themes of plugins per se. You get a free platform to share your story. You don’t need to build an audience; it’s already there on Medium. No ownership of the content you publish. At the end of the day, it’s all considered as Medium’s content. You are promoting their brand, no one will remember you as an author. Instead, they’ll never forget Medium. It’s almost impossible for you to export content from Medium to any other CMS. Lacks the flexibility of WordPress; you cannot generate leads, use plugins, or remarket your audience. Verdict: Who Is Medium Best For? Medium is best for all those who are just starting out in the blogging industry. The ones who are not yet sure whether they want to take blogging as their business or they love to express their words to the world. Medium is also great for startups, authors and columnists that aim to get in front of a huge audience without the hassle of a blogging software or WordPress hosting. If you’re looking for doing sophisticated things with your CMS like lead generation, affiliate marketing or monetizing with ads etc, starting a blog on WordPress blog is the right way to go. Joomla, with a market share of about 6% is not that popular as compared to WordPress but as a WordPress alternative to WordPress CMS, it is fully equipped. 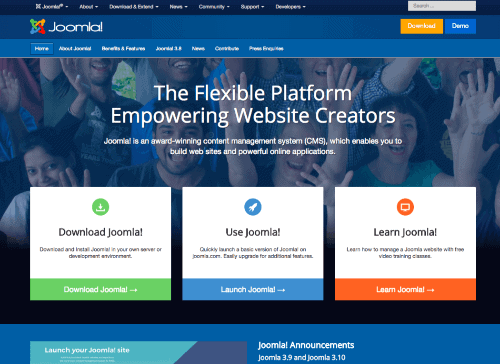 Joomla content management systemhas templates and extensions just like WordPress has themes and plugins. It has even more features like multilingual support and ability to enforce SSL that gives it an edge over WordPress. You get the user management role feature that has nine user roles starting from admin, editor, publisher, subscriber, etc. Joomla has a dedicated contact manager to find details of the right person and the right time. The level of customization with Joomla goes a step further. You can design your site with pre-built Joomla templates. Joomla is best for any type of websites but is great for eCommerce sites. Joomla has multilingual support right from that start which, on WordPress, has to be done with the use of plugins. It’s an open source platform meaning you can edit and distribute the code if you feel the need. With several free extensions, you can use Joomla CMS to build your eCommerce website like a pro. As it is an open source platform, there are plenty of support tools available for the community. Joomla community offers a ton of modules, which sadly, is hard to find and harder to maintain. If you have a multiple page website that gets thousands of unique visitors, everyday Joomla can demand a lot of server resources. Joomla doesn’t have anything close to what WordPress offers with it’s range of plugins. Verdict: Who Is Joomla Best For? Joomla is good for users who don’t want to get overwhelmed with the options that WordPress offers but still want to do more than basic WordPress alternatives like blogger.com or medium. While WordPress may win if you start a battle of WordPress vs Joomla, Joomla still would fit for people who want a CMS made simple. Another evolving and popular WordPress alternative is Ghost CMS. It is lightning fast, less bloated blogging platform as compared to WordPress. It is one of the newest sites like WordPress that has struck a chord with bloggers for it’s ease of use. Ghost platform has inbuilt SEO features thereby reducing the need to use SEO plugins at best and comes with AMP support out of the box. Ghost has a much more modern GUI (as compared to WordPress) built as a webapp in Ember and doesn’t need reloads all thanks to Ajax. The best editor to write laser-focused content. You can maintain all your content with an easily searchable archive at speed. Ghost comes with basic plugins (like SEO plugins or social sharing plugins) inbuilt. With Ghost, you can use their hosting or download the software to use your own. Proper SEO is built in directly that contains Mobile AMP, XML, Permalinks to give you the maximum search engine visibility. It is free to use if you upload it to your server. Purely built for avid writers & bloggers. The platform is still in a beta testing mode so chances are you might face some bugs in real time. Lack of plugins which makes it difficult for Ghost users to handle the content management with ease. Ghost is strictly a blogging and publishing platform. If you need anything other than that like eCommerce website or a small online store, Ghost is not helpful. Verdict: Who is Ghost CMS best for? Ghost is made for aspiring and professional bloggers who treat blogging as their business and want to a living out of it. It’s not made for newbie bloggers who are just starting out as its a paid blogging site. Squarespace is a Software As A Service (SaaS) website builder platform that is by far the most popular of WordPress competitors out there. With a monthly fee, Squarespace bundles you everything you need (like a CMS, hosting, templates, eCommerce and support) to run an online presence. However, when compared to WordPress, Squarespace doesn’t stand a chance. With WordPress’s large (colossal) number of themes, Squarespaces’ handful number of templates fade away. WordPress also allows to switch between the visual editor and HTML versions of your posts while Squarespace, like a true website builder, doesn’t allow you access to the raw HTML. With Squarespace, you get a selection of add-on widgets like a gallery and social media widgets. You can use Google AdSense to monetize on Squarespace. Squarespace offers eCommerce stores in all their paid plans. Fully customizable contact form feature with a lot many fields to tweak. You can create an advanced eCommerce store with login functions. Live chat support is available, so you get an answer to your queries instantly. Sophisticated template library to choose from that is both desktop and mobile friendly. Ecommerce plans are quite expensive at $26 & $40 compared to other players in the market. Not the best for a large website that requires deep menu hierarchy. All the updates are immediately visible to the public. A big issue when you are revamping your website. Verdict: Who is Squarespace best for? If you are a business owner and don’t know how to create beautiful looking websites than Squarespace is for you. For building a portfolio, restaurant, photography websites all you need to do is drag & drop the elements, and you’ll be all set with a stunning looking website. However, Squarespace as a WordPress alternative is a bit costly lacks the flexibility WordPress offers. Shopify is an all-in-one eCommerce platform that lets you create your own online store, sell products, accept payments and even manage your offline store with their service. If you’re looking to create an online shop, dropship or do things similar, Shopify is a better alternative to WordPress (which does the same with the help of woocommerce plugin) but with less hassle. It is free to use with a free sub-domain but would cost you $29/mo (their lowest plan) to get a custom domain and better features. You can add unlimited products to your store. You also get unlimited bandwidth and online storage. When you use Shopify payments, you get an inbuilt fraud analysis feature. You can add discount codes as per your liking on all the products you wish. Abandonment in cart sends automatic emails to customers. Shopify is one of the cheapest ways to start selling your products online. More than 500k stores are built on Shopify which makes it a safe to use platform. Super clean and easy to use interface. It comes with a built-in blog support. Adding custom fields like name, and email boxes are complicated. Not a blogging platform per se. Shopify isn’t easy to export blog posts to other CMS. Verdict: Who is Shopify for? Shopify is strictly for those who want to starts or are planning to build an online eCommerce store. It’s not any typical blogging platform they have a distinct goal (to make online stores), and they are killing it. 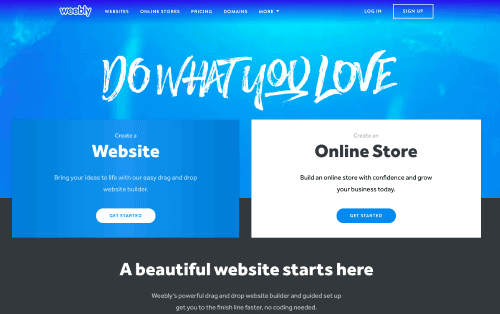 Weebly is another website builder similar to Squarespace and Wix. With Weebly, you can create your custom domain name, and you get a bunch of fantastic looking templates to use. Weebly requires no technical knowledge and the drag and drop user interface allows you to create anything you desire with a few clicks. If you’re just starting out and looking for a simpler, affordable alternative to WordPress, you can try Wix out. You can build and edit your website in mobile with Weebly. Easy to use drag & drop builder to save a lot of your time. Create your galleries and custom colored backgrounds. Templates are both desktop and mobile friendly. Since Weebly is a closed system, the team manages the updates and installations behind the scenes so that you don’t have to hassle with updates or website breakage. One of the easiest website builder to use in the market right now. You get a ton of free pre-built page layouts to use on your website directly. The drag & drop builder has certain limitations. With Weebly data transfers and site migrations (in case you decide to switch CMS) is extremely difficult. Weebly also keeps a 3% cut off per transaction above of what your payment processor (PayPal, Stripe etc) charge you. Pricing: Free, Premium plan starts from $4/mo to $25 per mo. Verdict: Who is Weebly best for? Weebly is best as an alternative to WordPress for users who want to test blogging or eCommerce starters to test the waters before diving in. Wix is a similar drag & drop builder like Squarespace. One thing to notice here is, Wix is not a paid CMS platform. Instead, it’s a freemium tool for anyone to use. You can create a free website with wix. With this free plan, you don’t need to buy domain names and will hve to adjust with the wix.com sub-domain. However, if you want to create your custom .com or .net domain you need to upgrade to their paid plans. Wix is a very newbie friendly website builder of CMS platform where you don’t have to hassle with themes and plugins updates (Wix team manages all core updates) and can count on a very dedicated customer support (even via phone calls). All the templates on Wix are mobile friendly so you won’t face any Google indexing issues. Wix free hosting is highly secure and reliable. You can create your custom domain using Wix platform. Wix offers more than 500 designers made templates to use. 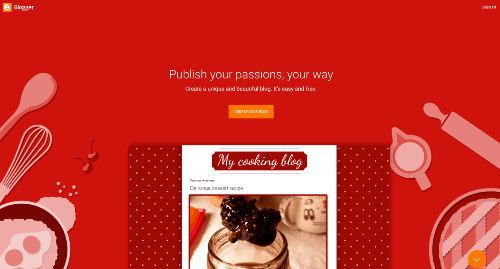 You can add a beautiful looking blog to any of the templates on your website. You can go flexible with the elements in wix to take your designing to a whole new level. Animate text and other elements to make your website look highly professional. Wix automatically creates backup points for your site. You have limitations with templates that cannot be changed easily. Wix plans are costlier than the competitors pricing. Verdict: Who is Wix best for? Perfect for users who don’t know how to code a professional looking website. Also for those, who want high flexibility while creating the site. If you are a student, you can try Wix’s free version to showcase your projects and skills. Google’s own blogger or blogspot platform is a free alternative to WordPress that you can try for free. Being a free blogging site, Blogger helps you create a simple website, jot down ideas and articles and even use it as a decent publishing platform. If you want a simple website and free alternative to WordPress, Google’s blogger is the way to go. But if you’re looking to have custom designs or do complicated things with plugins, Blogger isn’t your thing. One of the key things people starting their blogs on Blogger must know is that if you’re planning a long-term blog or monetizing it, blogger isn’t your thing. Blogger gives you tons of free templates and themes to make your blog look professional. Publishing your content with Blogger is too simple. You can share your story within minutes with blogger. The best part is you get a free custom domain for a lifetime with Blogger to use. You can monetize all your traffic with Google AdSense. Blogger is free for lifetime. Google has a vast knowledge base to solve all your queries. Google offers free hosting to host your blogspot site so you don’t need to worry about hosting. As Blogger is built by Google, integration with other Google products is easy. You don’t own the content. Google is notoriously famous for killing it’s products and can any day shut the platform or can charge money. You are limited to use specific functionalities to some extent. Moving your site from Blogger to other CMS is a risky task. Verdict: Who is Blogger best for? Blogger is one of the most popular free WordPress alternatives for those who are just starting out in the blogging industry or are just testing the blogging waters. You can also use blogger as an online journal but remember to take regular backups. Tumblr is a basic blogging site that combines the power of social media with blogging. Other users can freely like and reshare your content which is great to get more exposure. That being said, Tumblr is a very basic blogging platform and you can’t expect to do much with it. It has its self hosted platform, so you don’t need to spend money on hosting. Publishing is easy which also supports images and videos. Tumblr uses a variety of functions to ensure that all your articles are SEO optimised. It seamlessly integrates with Facebook, Twitter and Feedburner. You can connect Google Analytics with Tumblr and monitor the traffic and churn out data points. You get to see all topics being covered under Tumblr blogs. You name it, and it’s already there. Schedule your posts to eliminate any third party involvement. No room to grow your blog exceptionally well. With its fancy looking dashboard instead of being creative chances are you might end up wasting your time. If you are taking blogging as your profession, Tumblr is not something you should go for. Verdict: Who is Tumblr for? Tumblr is best for all those who love fancy colors and beautiful looking dashboards. You’ll fall in love with the design. You can use Tumblr as your hobby blog where you can share your life experience. However, if you are planning to build a professional blog on Tumblr than you should rethink it. Drupal is another strong WordPress competitor that actually offers many more features than WordPress. Drupal offers features like taxonomies, content types, blocks, views etc that make is a more advanced CMS than WordPress. While all these features make Drupal a better WordPress alternative, they also steepen the learning curve. 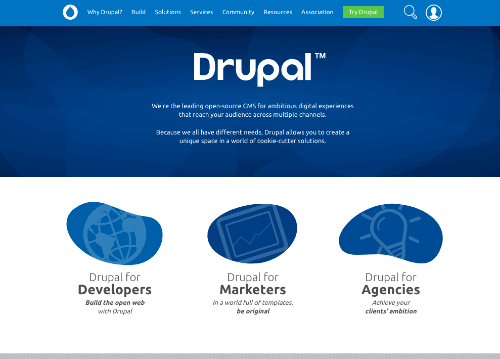 Drupal is a CMS for developers by developers. You’ll even need developer skills to handle simple things like installation and updating of modules (Drupal’s version of WordPress plugins). It’s purely a building tool and is best for advanced website developers. Drupal can handle large volumes of content and thousands of users with ease. Drupal has more better configuration for individualized access to private content thereby giving more control over who sees what. One of the best CMS platform to build highly professional websites. If you have previously made website other than Drupal now, you’ll start loving Drupal more. Excellent choice for community websites. It’s hard to understand for a layman user. Drupal isn’t exciting if you don’t add custom modules on your own by coding them. Verdict: Who is Drupal best for? Drupal is strictly built for developers who know how to code a website from scratch. If you are looking for a drag & drop site builder Drupal will disappoint you big time. If you have a enterprise level site or are creating one for a high security purpose, Drupal is your thing. So, what’s our verdict on the WordPress competitors you just discovered? You can use Shopfiy to get a better eCommerce experience but it will lack the blogging functionality of WordPress. Similarly, Drupal might be great for complex and high-security websites but has a steeper learning curve than WordPress. In a nutshell, each of the above 10 WordPress alternatives have something better than WordPress but no one qualifies as a full-fledged alternative. As our final verdict, Shopify is a clear winner when it comes to flexibility, functionality, ease of use and pricing. It also has a huge community for support. 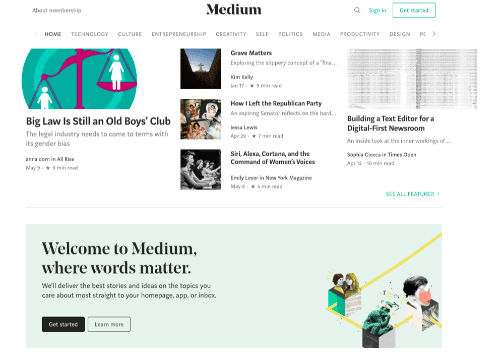 And in case you want a minimal blogging experience and get your content in front of an already existing audience, Medium.com should be your go to. Have you used something else instead of WordPress? What blogging platform do you prefer an an alternative to WordPress. Comment below your preferred choice and why you choose it instead of WordPress. No, Wix stands nowhere in comparison to WordPress. The free version doesn’t even allow you to use a custom domain and the paid versions lack in functionality as compared to the pricing with WordPress. With Wix, you cannot switch the template (similar to WordPress themes) once you have chosen one. Wix also has limited functionality when used as a eCommerce website as compared to WordPress, not to mention the heavy pricing which is unnecessary I feel. Ghost is definitely NOT better than WordPress. Use it if your sole purpose is to use it as a blogging platform. Other than that, Ghost lacks the versatility of WordPress making it unsuitable projects like forums, eCommerce stores etc. Another thing you need to keep in mind is, the pricing of Ghost, which charges about $29 for 100k page views per month and two staff writers which is way more costly as compared to the freedom, ease and affordability. You don’t need to. WordPress and Wix are two separate content management systems so you either use WordPress to set up your online store or choose Wix for that matter. If you have to choose between Wix and WordPress, WordPress is the way to go. You have listed some awesome alternatives to WordPress. WordPress is definitely a great and easy way to publish content online and it is also #1 choice for bloggers. However, I find Medium a good alternative and have used them occasionally. It is a great platform to share content with your readers. Thanks for sharing these good alternatives. Here, great to know about WordPress alternatives. I have used bloggers and Wix blogging platform for my website. I personally like WordPress, but every blogging platform has its own pros and cons. I have heard a lot about Joomla and I think I should give it a try. The provided links in this post help to access these blogging platforms easily. Glad to see you back. Yes, even though I like WordPress like I like tea, it’s always better to use blogging sites and platforms that are specifically made for your purpose. For examples, if I wanted to go drop-shipping or eCommerce way, even though WordPress can handle it decently, going Shopify route is the best choice you can make. Or you simply want to create a blog but don’t want the mess of technicalities like themes or updating plugins etc, choosing Medium as your preferred blogging site is the best.